Working at K21 has one great advantage. We DON’T have 30 days vacation. In fact, if I want to take a vacation or a few days off, I just need to put the days I’ll be off in the agenda, and that’s that. Then I just don’t show up on those days. There’s no approval by management, request to HR, no one controlling whether you took 30 or 40 days of vacation. The company is self-organized and people are responsible for dealing with this freedom. And time off is great, really great. One day I decided to take a day off to spend time with my daughter Mari. I wanted to see what her day was like. In the rush of work it’s easy to disconnect from the lives of those we most love. I took her to swimming class and saw how much she’s improved, and all the fun she was having with her friends in the pool. We talked about her school friends and tried finding some cards Mari said “everyone’s collecting”. Which must be true, because we went to three newsagents and they’d all sold out. At school she saw a friend, ran up to her and gave her such a big hug that they both fell over. It was a day when I was able to follow Mari’s routine, talk to my wife, finish reading a book and write a text I’d been having trouble finishing for months. I know that, unfortunately, taking weekdays to reconnect with the family, friends or even our own lives, isn’t possible at most companies. In our culture, we associate time off as something bad, a synonym of laziness, to be fiercely fought against by management and collaborators alike. Some companies go to extremes and “frown upon” those who take their 30 days off or switch off their phones on weekends. Some even demand that their workers make up time taken off for training, even though they know the knowledge acquired will be used in improving the company itself. At some point, a link was made that X hours at work equals X hours productivity. But is this true? One practical result of this culture is the creation of task-driven people focused on executing tasks and not delivering value. Andressa Chiara talked about task-driven teams in the post: Transforming task team into product team. Do you have the feeling that everyone’s working, but nothing is being delivered to the clients? Does the development, delivery and user cycle, which should take weeks, take months? 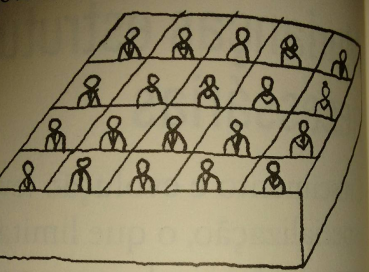 Are people allocated to multiple projects (shared “resources”)? If you answered yes to any of these questions, you’re probably in a place where the task-driven mode is turned on. Making sure everyone is really busy doesn’t mean they deliver more. Do you like using your computer’s CPU running at 100%? Or driving in gridlocked streets? Traveling on packed buses, trains or subways? Probably not. So why the hell should people be busy 100% of the time? The busier people are, the slower their rate of value delivery. In 2012, Stefan Thomke and Donald Reinertsen wrote the six myths of product development. For them, fallacy number one is: high use of resources improves performance. Based on research, the authors presented a graph of utilization and made the claim: waiting time doubles when utilization moves from 80% to 90%, and double again as it moves from 90% to 95%. Let’s imagine that the above graph belongs to the Products Team. We’ll say this team needs information from the Legal Team to develop part of the product. But the people on the Legal Team are very busy and cannot take on external requests right now. The Product Team opens a ticket which will one day be served by the Legal Team (you can substitute “opens a ticket” with: sends an e-mail / makes a demand / makes a request for support / talks to management. Depends on the organization). When the Legal Team finally works on this ticket and gets back to the Product Team, the latter no longer has time to see what was done or clarify doubts, because they’re too busy doing other things. And the cycle repeats itself. Now multiply this problem by the number of dependencies between the teams and units in your company. “If you want to be sure your company won’t deliver anything to its clients, just occupy the staff 100% of the time”. It may seem like a contradiction, but time off is good. This may mean time completely off for a collaborator to spend time with the family and return recharged. Or productive time off to create an important result for the company. Avelino, CFC, Day and Samuel taking creative time off in the park. 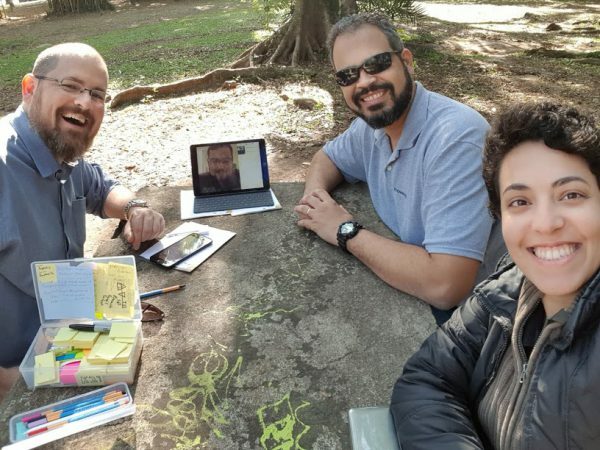 In the above picture, CFC (connected from home), Day, Samuel and I went to Ibirapuera Park for a while. 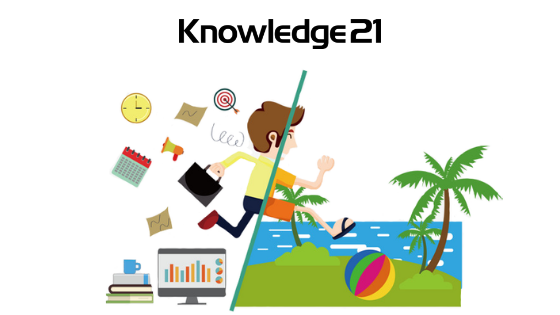 We walked and looked around, improved some trainings and created a new service for K21. Follow our blog: soon we’ll publish how Lean Kanban can help you to identify systems in stress and visualize the flow of value in order to get out of this task-driven mode.